Since ancient times, shamans in Brazil’s Amazonian rainforest have been concocting a psychedelic brew called ayahuasca or yagé. Made out of the f Banisteriopsis caapi vine and other plants native to the rainforest, the psychedelic tea contains dimethyltryptamine (DMT), sometimes called the ‘spirit molecule’, and those who ingest it report the trip of a lifetime. 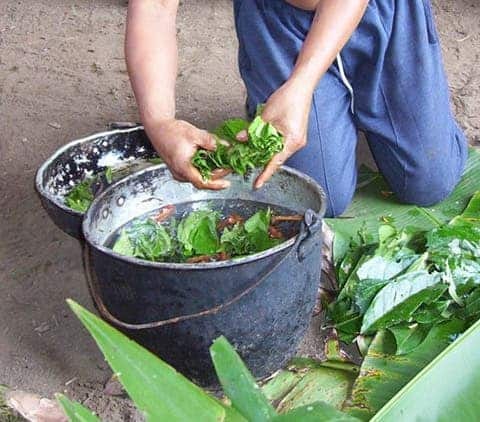 Traditional ayahuasca brewing. Credit: Wikimedia Commons. There are many books written by daredevils and explorers about the spiritual and therapeutical effects of ayahuasca but these reports have been anecdotal. Now, the world’s first randomized clinical trial has confirmed the brew’s therapeutic value, at least when depression is targeted. The international team of researchers found ayahuasca rapidly improved mood and eased depression symptoms better than a placebo. Among its many qualities and characteristics, ayahuasca tea has a foul, bitter taste so to fool study participants they were ingesting the real deal, they gave them an equally foul tasting brown-colored liquid. All the participants also had to have no prior experience with ayahuasca or any other psychedelics for that matter. This was vital for the randomized clinical trial’s effectiveness because had a participant ingest ayahuasca before, no placebo could have deceived him. Ayahuasca induces extremely violent nausea, with some people reporting feeling as if they had died. The potency of the trip is also unheard of and can last for hours… in standard time. Some 24 hours before the experiment, each participant filled a standard questionnaire meant to gauge how depressed they were. During the experiment themselves, the participants were seated inside a quiet and supervised environment where they would either receive the potent psychedelic brew or just the stench placebo. Each participant then completed the same questionnaire one, two, and seven days later, respectively. 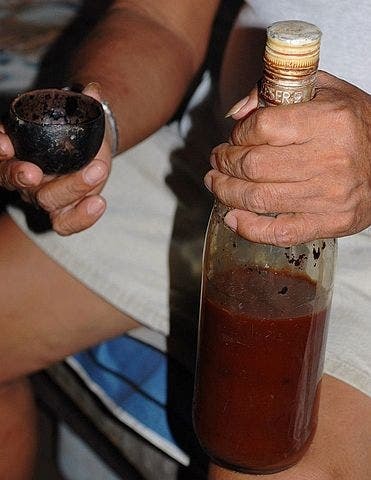 What Peruvian ayahuasca looks like. Credit: Wikimedia Commons. Both groups reported significant improvements one or two days after the treatment. Oddly enough, those who were given the placebo sometimes scored as high as the participants who had ingested genuine ayahuasca, which can only mean the brew’s reputation is widely famous. The therapeutic effects of the ayahuasca brew became evident, however, once a week had elapsed. Some 64 percent of the participants who had taken ayahuasca reported a 50 percent reduction in the severity of their depression symptoms. As for those who were handed the placebo drink, only 27 percent felt their depression eased. “There is clearly potential to explore further how this most ancient of plant medicines may have a salutary effect in modern treatment settings, particularly in patients who haven’t responded well to conventional treatments,” Charles Grob at the University of California, Los Angeles, told New Scientist. The findings seem to echo preliminary research carried out by Gerald Thomas, who researches addiction at the University of Victoria, British Columbia. In 2013, he and other researchers from Multidisciplinary Association for Psychedelic Studies (MAPS) — a non-profit research and educational organization that develops medical, legal, and cultural contexts for people to benefit from the careful uses of psychedelics and marijuana — found that ayahuasca can reduce dependence on addictive drugs. Thomas argues that ayahuasca therapy helps ease the pain of traumatic memories which cause many people to self-medicate with alcohol and other addictive drugs. Psychedelics, in general, seem to have made a comeback as far as medical research is concerned. For decades, psychedelic research has been hindered by social stigma and government regulation, i.e. illegal status. Over the last couple of years, however, multiple groups have found substances like LSD or psilocybin, the active ingredient found in magic mushroom, help ease depression, addiction or PTSD. Ketamine deserves a worthy mention, although it’s not technically a psychedelic. Now, ayahuasca seems to join their ranks which is important for medicine although the findings will likely change nothing for the thousands of ayahuasca tourists who already flock to the Amazonian basin in search for spiritual awakening or, why not, a good thrill. If you’re fascinated with ayahuasca and would like to embark on such a trip, you should know that there are many so-called shamans that are nothing but charlatans. Dozens of ayahuasca retreats have popped up over the last couple of years fueled by the hard currency of naive westerners. Ayahuasca is no trivial pursuit. It’s an insane trip which when taken unsupervised can leave some more scarred than they ever were.